When I first started working for Building Caring Communities, I kept hearing about this incredible author – Ella Manski – and every reference to this person made me want to learn more. The only problem was, she didn’t come up on any internet searches and I couldn’t find her books in the library anywhere. It was quite frustrating! Only a year later, when I saw his name written down – Al Etmanski – was I finally able to track down his books, ‘Safe and Secure: Seven Steps on the Path to a Good Life for People with Disabilities’ and ‘A Good Life – For You and Your Loved One with a Disability’. After seeing him host a panel discussion at the Museum of Vancouver on the ‘Science of Happiness’ and watching as he continued his best to facilitate the discussion away from the ‘experts’ and implore the audience to share more about what we were doing to in order to increase happiness and connection in people’s lives, I thought, now here is someone who I can relate to. And not only can I relate to him, but he and his wife, Vickie Cammack, are long time harbingers of change within the Community Living movement in BC and have much wisdom around the issues that we are tackling with Building Caring Communities and Can You Dig It. So I was excited to attend Al’s book (un)launch: IMPACT: Six Patterns to Spread Your Social Innovation, and arrived expecting to soak up more of whatever it is that he’s doing that sells out The Djavad Mowafaghian Cinema at SFU Woodward’s on a Monday night. 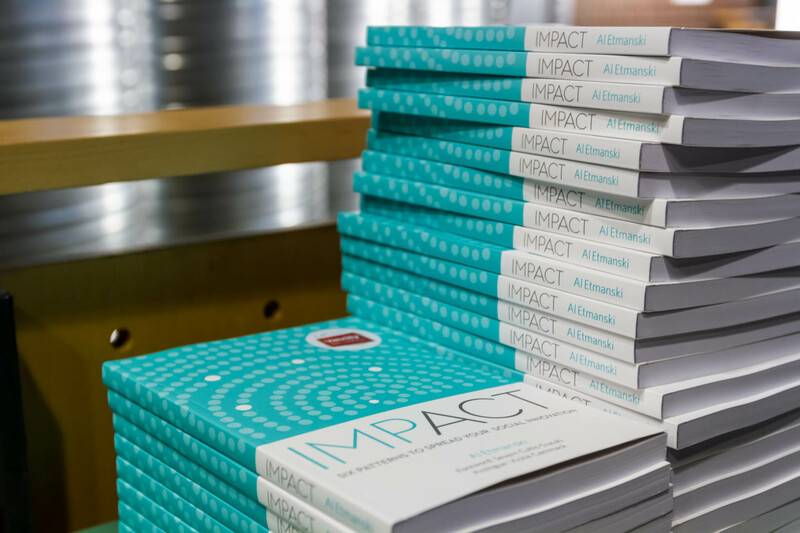 But instead of basking in the well-deserved spotlight, Al saw an opportunity to celebrate the stories of six local changemakers, whose inspiring work demonstrate the six patterns to achieve impact that are outlined in his book. Through this, I was reminded of the idea that a true leader is not someone who leads but follows. The evening began with a songstress with the voice of a whiskey drinkin’ angel, Claire Mortifee. Spoken word artist Meharoona Ghani opened (and closed) the evening, sharing her gift of verse and reminding us that playful improvisation and grace are essential for innovation. Al and Am Johal introduced and welcomed the speakers to the stage and each of their stories were beautifully woven tapestries demonstrating less about the impressive work they have accomplished and more about their approach to the work. And impressive work indeed – 80,000 sharks have been saved from being harvested for their fins, but the real impact was the story of how Claudia Li began to ask herself what she cared about and addressed the nuances of racism in environmental campaigns by shifting the attention away from facts and figures and focusing in on, and encouraging, the values in a more ecologically sensible way. Tamara Vrooman called our attention to the spirit of DIY and ‘passionate amateurs’ by telling the genesis story of Vancity. Donald MacPherson’s lively recollection of events leading up to the implementation of the Four Pillars Drug Strategy demonstrated the need for various types of social innovators – disruptive, bridging and receptive – and that these roles can exist within one person. Jason Mogus, of Communicopia and Web of Change reminded us of the importance of collaboration and intention – that the building of movements is far more powerful than creating new brands. He also said ‘Be dumb enough to say yes’, which is exactly what recent law school grad, Mike Harcourt did, when a group of community organizers asked him to represent them in stopping the Trans Canada highway from bulldozing neighbourhoods to build an eight lane freeway along the waterfront to downtown Vancouver. If you can imagine each of the six patterns in Al Etmanski’s book being a different colour thread, by the end of the night the audience was deeply comforted and wrapped in a beautifully coloured blanket woven from the stories of the evening. Hats off to Lisa Joy Trick for curating such an enjoyable, inspiring and impactful evening! Mike Harcourt concluded by saying “Vancouver is a place where people working together can make big ideas happen.” So let’s all read Al’s book, support each other to pursue that which ‘sparks’ us, and see what big ideas we can manifest! !